Gertie's New Blog for Better Sewing: Most Awesomely Bad Pattern Finalists! Most Awesomely Bad Pattern Finalists! Readers, a journey of a thousand miles can begin with a single pattern for apron chaps. Let's take another moment to thank ZipZapKap, who brought them into our life. (And visit her fab Etsy shop here!) Inspired by these apron chaps, you lovely readers have sent me many truly awful submissions for the Most Awesomely Bad Pattern EVER contest. You came up with some serious contenders for the coveted title, and it was very hard to narrow it down to three. But now, without further ado, I present to you the finalists. 1. Anna sent in this ladies' jumpsuit from the 90's, complete with a lacy bib. Anna says, "Worst look ever. I do not miss the 90's. These could only be worse made in plaid flannel!" Take the poll to make your voice heard! Voting will close this Friday at Midnight (EST). May the most awesomely bad pattern win! Wow, those are impressive. I remember those jumpsuits--I had so many dresses in that style, but jumpsuits never. You're going to post the other contestant patterns that didn't make the finals, right? Please!! I was trying to imagine how most middle-aged men would look with their spare tires around the middle in that jumpsuit. It gave me such a laugh that I had to vote for that one. Oh, I had to vote for the ladies jumpsuit. It made me cringe in remembered horror. This is definitely a tough one. All three are worthy contenders. Trudy, I remember actually seeing middle-aged men with the spare tires wearing those things. They were always baby blue. Awesome indeed. I don't actually believe that the first one can be anything other than an insanely cruel joke.. My vote went there! 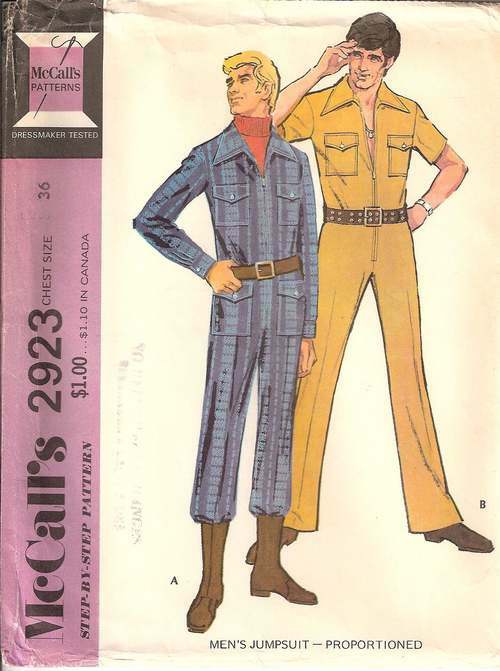 My Grandpa wore one of these jumpsuit things every day after he retired in 1978 (he was a CPA). 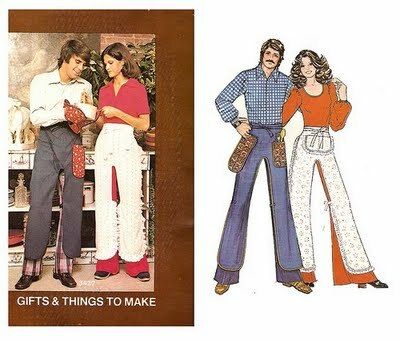 I'm guessing that Grandma had this pattern (or one like it) because she sewed everything including his pajamas and bow ties. I guess after a lifetime of suits this look said "ultimate comfort" to Grandpa...yikes! The mind reels. I'm afraid my vote is going to take some serious consideration here. These are such heavy-hitting contenders that I can't make a snap judgment -- I may need a televised debate between the three. Thanks for the laugh. It might be fun to watch someone try to put a backpack on their cat. I'm kind of sad to say that I think I owned a jumpsuit that looked not unlike that at all. Thankfully it was 5th grade before anyone really noticed. I barely dodged a bullet there. Holy smokes that 80s jumpsuit is a thing of horror. That's probably not just the worst pattern ever, but the worst piece of clothing ever. That beats my submission by a mile, I'm sorry to say! 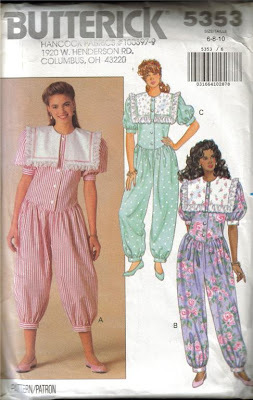 I had to vote for #1, he 90's jumpsuit, because as a four year old in 1991, instead of getting a new pretty Easter dress, my mother chose a terrrrrrrrible floral jumpsuit, with exactly that collar and volume. I am scowling in every single photo that year, and am apparently still bitter. ACK! that jump suit! AHHH! I wanted to elect it as awesomely bad.. but there is NOTHING anywhere near awesomely about it. Oooh, that jumpsuit is a sight to behold... I still don't believe anything can beat the 'pinnie-chaps' for surreal badness, but jumpsuit has to come a close second! Some are just goofy, but others are really very awesomely bad! Had me chuckling for ages and I still haven't gone through half the posts. It was the cat backpack that clinched it for me. Where do I lodge a complaint? I wanted to vote for more than one! LOL But had to finally narrow it down to the last one. I can not even conjur up the image of some man with the bloused legs of this horrible jumpsuit. Horrible. simplicity did a whole line of pet patterns. If I remember right, it included several that had matching human portions, so you and your dog could match. the drugs were so much better in the 70s. for instance, if you ahve an urge to buy one. As men (and women, isn't it, Rosie the riveter?) actually sometimes have to wear these jumpsuits for work, I don't think it is that silly (but ok, styling is atrocious). And whatever it is, I can't figure an animal pattern that wouldn't be silly, so this vote would be for the whole category. So I chose the ladies jumpsuit, as it is both impractical, toroughly ugly in its design, and that as a cherry on the cake (and even if I like stripes, polka dots and flowers) I find its styling atrocious! omg!! my mother made me that ladies jumpsuit--maybe the kids version of that very pattern! !--when i was 12!! it was made out of blue ticking with pink hearts--ugh!! now to make sure that no photos of me in that horrid ensemble exist....how embarrassing! OHMYGOODNESS... are you actually meant to wear the bib jumpsuit OUTSIDE!?!?!?!?! LOL!! The 1st jumpsuit. I don't think fashion ever got more awful than that. Stunningly dreadful. I have a stash of my grnadmother's mags from the 1950s-1980s with some wonderful awfulness - but nothing quite this terrific. Oh gertie, I'm sitting here shaking and crying with laughter. This post has made my day! BTW my doggie Alf wants me to resize the cat pattern. Where can I get it! I had to go with the 90s jumpsuit--if only because I remember things like this (and *gulp* wearing them! ), and still cringe at the memory. lol! Hey! I like cat clothes! Number two pretty much combines all the worst elements of every bad outfit I wore in the early 1990s as a little girl. Just add some cabbage roses on a black background, and you are set! Dear God. Imma let you all finish voting, but that women's jumpsuit is definitely some of the worst pattern of all time! OF ALL TIME!!! I like the cat pattern too - seriously, it's cute. My three cats wore lace collars on my wedding day - bridesmaid's outfits. My daughters wore those jumpsuits when they were teenagers and I personally thought they were so cute. the mental image of mustard jumpsuit guy trying to retain any dignity while using a urinal is hard to wipe from my mind, but the 90's adult baby jumpsuit wins by a hair..
it's a contest between the apron chaps and the bibbed jumpsuit but the bibbed jumpsuit won in the end. it's really tres awful. the men's jumpsuits are not too bad considering how many people wear similar stuff on factory floors. 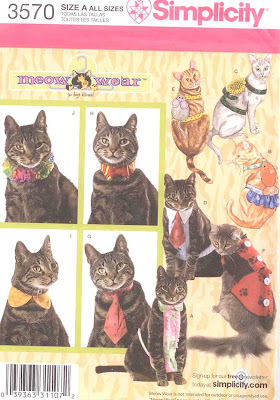 as for the cat accessories.....i can't imagine any feline willing to be subject to such indignities. I think it looks lovley! Um, I totally had #1. Maybe two of them. I'm a child of the 80s whose mother kept sewing way past when I asked her to. Saddest part? I ALWAYS got compliments on that outfit (in my defense, it was a lovely shade of olive with red ribbon trim on the collar in place of the lace, but still). The cat stuff!! That is so funny. It really makes me laugh. I don't like clothes on animals but this is hilarious. Poor kitty... I made my cat a t-shirt (he was licking himself so much his skin was raw so had to stop him somehow) and he HATED me for it. Do people really make these things?